Happy Lunar New Year! 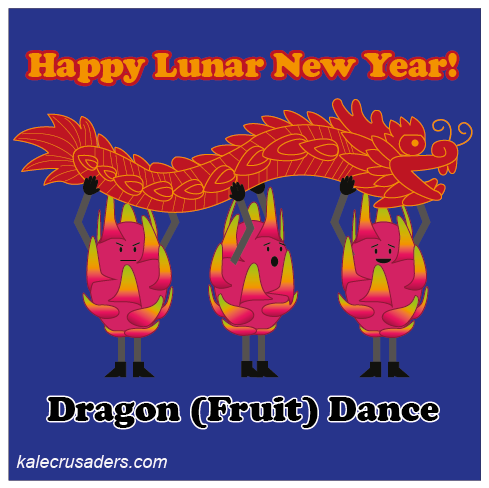 Dragon Fruit loves this time of the year, especially the dragon dance. Although Dragon Fruit is not served as part of a traditional New Year's meal, it can be enjoyed au naturale, in a salad, or as a dessert. P.S. Back in 2011, The New York Times covered Dragon Fruit's "knack for getting noticed." Happy 2013 2014! In 2013 we were a bit under the weather, but today we're back with some new cartoons. We are playing around with the idea of cartooning some of your favorite underrepresented foods in new situations, including the recipes of talented food bloggers. 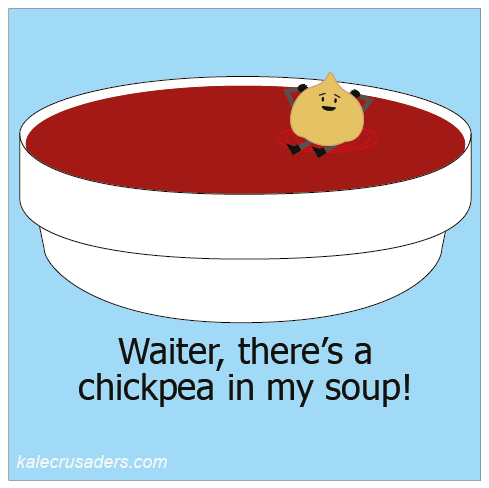 As you may already know, chickpeas lurk in the darndest places, including this Quickie Tomato Soup by Kathy Patalsky of Healthy. Happy. Life. Legumes, potatoes, cauliflower, and nuts provide some pretty sneaky and delicious ways to add creaminess to soups without actually adding cream.